When we talk about chocolate salame, my mind goes immediately to what we call rotolino in my family, a soft sponge roll brushed with the ubiquitous pinkish alchermes and spread with chocolate and custard. But there is another chocolate salame, which is made with very few ingredients that you will probably find in your pantry, and that really resembles the salame you would buy at your local butcher. 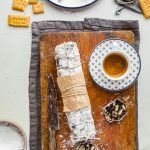 In Tuscany it is also known as salame della nonna, grandma’s salame, and this certainly refers to the habit of grandmothers to be generous with butter when it comes to baking for their grandkids. I remember that dessert made with dry cookies, alchermes, butter cream and almonds that grandma would occasionally make on a Sunday. Or the mantovana, a buttery cake topped with pine nuts and almonds. Then, there was this chocolate salame, simple in its preparation, with ingredients that were always at hand in the pantry, a couple of eggs, a packet of cookies, those that we call the marie, some butter, cocoa powder and sugar. You won’t find nuts, not even dark chocolate, or liqueur: the aroma and the taste of cocoa powder shine though, unfiltered. 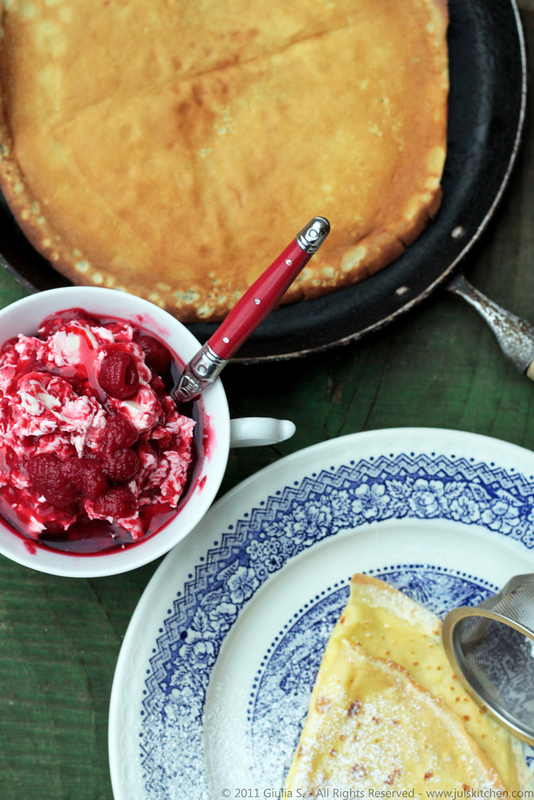 It has the spontaneity and the frankness of those recipes born from the pantry. This is the chocolate salame of kids’ afternoon birthday parties, of rooms full of colourful balloons, gift paper excitedly torn into a million pieces, soft milk buns with prosciutto, tiny round pizzette that you could eat in one bite, bowls of popcorns and chips. Slice it in a candle-lit living room and serve it after dinner with an espresso, or a tiny glass of vinsanto or amaro, and it will shad its playful and childish character to take on an adult aura, almost like a meditation wine. Break the cookies, mix them with eggs, butter, sugar and cocoa powder in a sticky dough, then shape a log with your hands, get dirty with cocoa and butter, lick your fingers as this is one of the reasons to make it. Wrap the salame in clingfilm and roll it on the table, then stash it in the fridge until cold. Now dress it like a proper salame: dust it with icing sugar to replicate the mouldy skin and tie it with cooking twine, as if it had just passed under the hands of a butcher. I made the chocolate salami directly on the SapienStone worktop, the one I chose in the natural finish Calacatta texture. I chopped the biscuits, kneaded butter, sugar and eggs, I dusted everything with cocoa powder, then I managed to clean easily the worktop with a sponge, getting ready to take new photos. The marble-like finish is not only beautiful to use as a backdrop for my photos, but it is also stain-resistant, scratch-resistant and heat-resistant, a perfect surface for cooking and to take a thousand step-by-step photos. Break the biscuits coarsely with your hands: do not use a blender, as we need some texture here, the biscuits will look like the fat in the salame. Cream butter and sugar, then add the cocoa powder. Once the cocoa powder has been incorporated, add the eggs, one at a time. Scrape the sticky dough on a working surface and mix in the chopped biscuits. With a spatula, or with wet hands, place the dough on a piece of cling film, wrap it and try to give it a cylindrical shape. Stash in the fridge for a few hours, until cold and solid. Remove the salame from the fridge and roll it in icing sugar, then tie it with butcher’s twine as if it were a real salame. Serve it sliced. Keep in the fridge for a few days. The eggs must be fresh: the dough of this chocolate salame is not cooked, so you need to use fresh eggs you are confident about. For this reason, you can keep the chocolate salame in the fridge for two to three days. If you have leftovers, very unlikely, it is better to slice it and put it in the freezer. Cocoa powder is the protagonist. Choose a cocoa powder of excellent quality, which will make the difference in many recipes. I am partial to what is called Dutch processed cocoa, which has a darker colour and a more intense taste of chocolate, it is less acidic than natural cocoa. Here you can read an article to understand the difference. Even butter wants to do its part, though. The ingredients for this dessert can be counted on the fingers of one hand, so, at risk of playing cheap, choose a butter of excellent quality. You can add pistachios or other nuts, a part of melted dark chocolate, the grated zest of an orange or a dash of liqueur or espresso. It is a recipe that comes from what you have in the pantry, so check those little bags left on the bottom of the kitchen cabinets, open the jars of dried fruit and create the unique pattern of colours, shapes and flavours of your chocolate salami. I listed some other versions of chocolate salame. It Italy it changes name, ingredients and aromas according to where you are. As any other recipe, alost every family has its own version, which, obviously, is the best. Have you ever made it? Do you prefer to use chocolate or cocoa powder? Here you can find Nigella‘s recipe for her chocolate salami, which calls for dark chocolate, amaretti, almonds, hazelnuts and pistachios. Rosemarie just shared her recipes, the Piedmontese version, know as salame del papa. I also love Shiran’s recipe for chocolate salami, and you can also see her video on how to make it. Manu has an eggless version of the chocolate salami, along with the classic one. From the Markets of Tuscany: A cookbook, is finally a reality, it has the smell of fresh ink on paper, the weight of a dream turned into a book to hold and love. It will be available from the 19th of April in Italy and from the 1st of June in Europe, US and Canada. You can already preorder the book on your Amazon if you are as excited as we are, or wait for a few more weeks to find it in your local bookstore. We’ll need all your help to spread the news, it’s the first time we’re going worldwide and it feels a little intimidating, but your friendship, your priceless support and your enthusiasm brought us here: so share the news with your family and friends, or about the book at your local bookstore! So here’s to you and to dreams becoming a reality! You can have a preview of the book by downloading an extract from here. Please let us know what you think of it, and, if you like it, you can already preorder it on Amazon.it, Amazon.com, Amazon.co.uk, Amazon.ca or buy it from the 1st of June on your local bookstore. Thank you for this lovely recipe. I see lots of photos of Marie cookies online but they are mostly round and Hispanic brands. Is that the same type of biscuit. So many versions of this recipe. All very good & great timesaver instead of baking a cake. Fantastic! My Italian mother did not make this, but I certainly will!